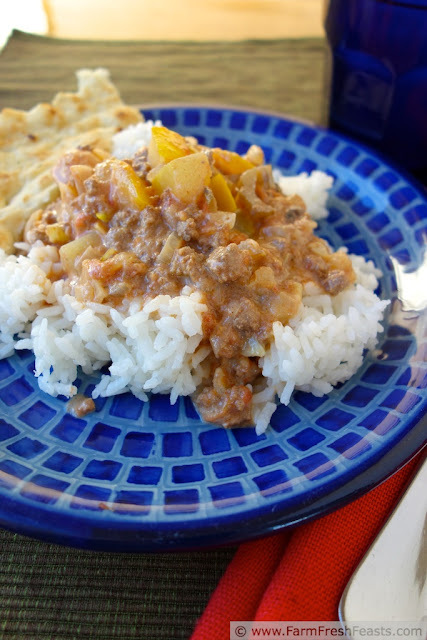 Indian spices, patty pan squash and ground beef comingle in this slow cooker supper. A tasty way to feed the family from the farm share on a busy afternoon. With school starting I feel like I'm supposed to say our days will get busier, but more than the busier Fall days, I am looking forward to the structure of the coming weeks. Without any structure to each week (my activities have been irregular this summer), meals and meal times have really been fluid. We'll eat lunch at 2 pm, then not really be hungry for dinner. Having the kids up at ___ time, out the door at ___ time, with evening activities at ___ time will give me a framework on which to hang meals. Then my spouse will return, and we'll soon be in the swing our our family routine again. I'm looking forward to that. I use my slow cooker year round, but not often enough for it to get Pride of Place in the kitchen. It lives in the basement Active Storage area. Technically I have 3 slow cookers, so they live in this area. [My spouse has an engineer brain, so we have an Active Storage area and a Cold Storage area--which doesn't store food, but does store less frequently accessed items like Christmas decorations.] I primarily use my ancient 3-4 Quart Crock pot, but I love to heat spaghetti sauce in my little one (for the days when my son is in charge of boiling the noodles right before the rest of us get home) and make Kalua Pig or soup stock in my large one. 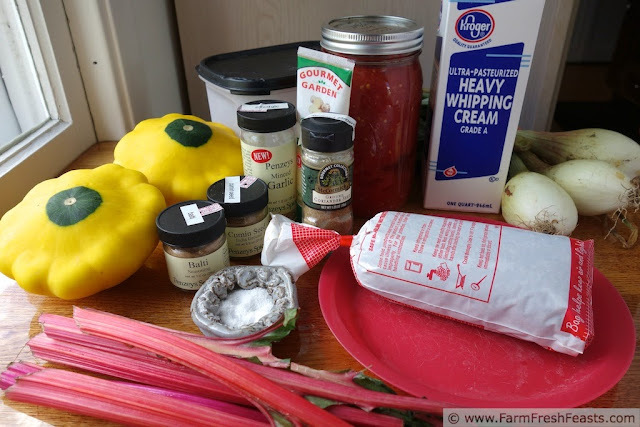 I developed this recipe from a desire to use some of the cow in the freezer and the patty pan squash from the CSA farm share in a form that my kids would enjoy over multiple meals. They loved Rebecca of Foodie With Family's Slow Cooker Chicken Tikka Masala when I riffed off it to make my Slow Cooker Chicken and Chick Pea Tikka Masala. I figured I'd do something similar. Since tikka = chicken it makes no sense to title this dish "Tikka" anything as there's no chicken in it, but since masala = a sauce, usually with tomatoes and spices and cream, I'm good with my title. This makes a lot, and the leftovers are good in a thermos for a school or work lunch. If you don't have a pile of ground beef in the freezer, you could easily sub ground turkey or chicken (then you can call it tikka again), or keep it vegetarian with cooked chick peas or red lentils. If you don't have patty pan squash, then yellow squash, zucchini, or even peeled and cubed acorn or butternut squashes will substitute just fine I think. Let me know. If you don't have chard stems, just skip them. I hate to waste edible food, so I plussed up the veggie content of this dish by including the chard stems I had in the crisper. If you don't have the specific spice blends I used, Penzey's Balti and Rogan Josh, don't worry. I didn't have the garam masala Rebecca called for so I subbed with what I had. Use any type of crushed tomatoes that you have--store bought or home canned, whatever you've got. I'm canning tomatoes these days because I love the utilitarian potential of a jar of crushed tomatoes. It's ready to use in a flash and can be used in a wide variety of cuisines, like this Slow Cooker Squash and Beef Masala. In a large skillet, heat a splash of cooking oil over medium heat. Brown ground beef, drain, and stir in cumin and coriander. Heat until fragrant, then transfer meat to a crock pot (at least 3 quarts, but you don't need one of those monster ones). In the same skillet, add another splash of oil and sauté the onion, chard stems, and squash over medium heat until they start to soften, about 5-8 minutes for my overfilled skillet. Add the garlic, salt, ginger and seasonings and continue sautéing until fragrant. Stir in the tomatoes and sugar. Bring to a boil over medium high heat, then pour over the meat in the slow cooker. Give the slow cooker a stir, then cover, PLUG IT IN AND TURN IT ON Low for 4-5 hours. About 15 minutes before you're ready to serve, whisk together the cornstarch and cream in a small bowl. Pour it into the slow cooker, stir, cover and heat until it begins to bubble. Serve over hot cooked rice. This reheats wonderfully well. This post is shared with the Clever Chicks Blog Hop, Tasty Tuesdays, Wednesday Fresh Foods Link Up, What's Cookin' Wednesday, What's In The Box, Food on Friday and the From The Farm Blog Hop. I love a slow-cooker meal and this one sounds SO good -YUM! Slow cookers are great, especially with a new baby in the house. You can prep when you have time, and eat when it's ready. Love these flavors and such a good way to use Pattypan squash!!! The farm share has gone to town this year with patty pan and tomatoes. And I'm not complaining! I'm enjoying the bounty. If I close my eyes, I can smell the spices! What a great slow cooker recipe, and good use of pattypan squash (which I usually, and not very creatively, slice in half and throw on the grill). Patty pan squash makes such a pretty slice on the grill, though, so I think that's creative. I grilled mushrooms last night, and I'm so glad. I love mushrooms, but grilled? Just a little bit better. 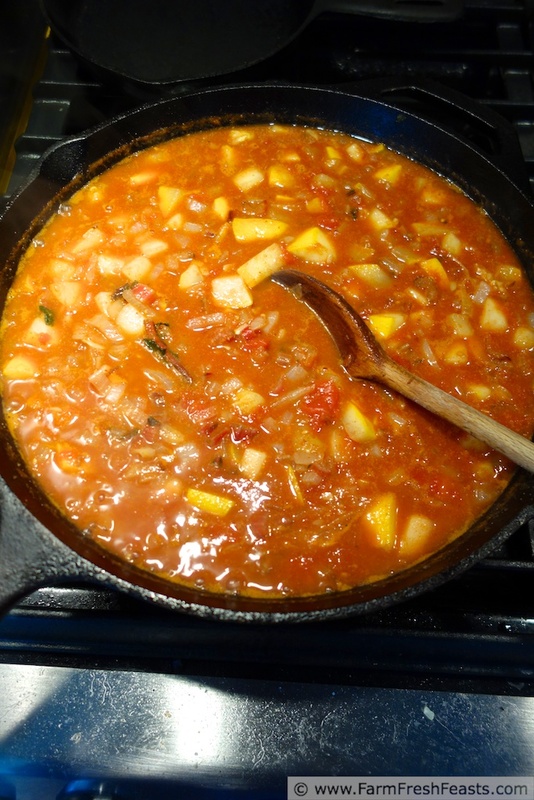 I like using my slow cooker too-I see myself moving into fall Slow Cooker mode even though it's still summer and the tomato plants are heavy with ripening fruit. Mmmm! The dear son eats ground beef now, so this is going on the list. Looks fabulous, with all the spices. 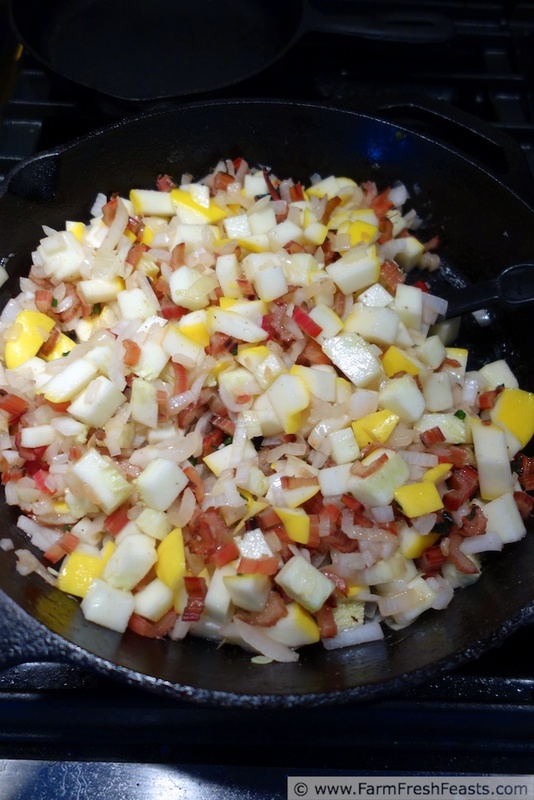 And what a nice way to use up summer squash, which can always benefit from lots of added flavor. Thanks for the recipe! Yay! Always happy when anyone of any age expands the list of foods eaten. That's a win in my book. This reminds me of my mother's beef stew, but better (don't tell my mom). Great use of the patty pans and the swiss chard stems. If this reminds you of your mom's beef stew, your mom must be a pretty creative cook. And you must get your creative cooking chops from her. Crockpot, use for squash AND ground beef... saving this recipe for sure!! This checks off multiple categories, no? This sounds perfect for when I start back at school and need to make something at the beginning of the week to heat up for the rest of it! This really does do well in leftover form. My daughter ate this breakfast, lunch, and dinner (not all in the same day though). Yes yes and triple yes to everything in your first paragraph! Love the dish--a ground meat dish in India is actually called a kheema. That's just some random fyi trivia, not a criticism. Your description of your basement cracked me up. Ours is half kids room (with a tiny corner wedges out for the treadmill) and the other half sounds like your active storage. I like that term, I think I will adopt it. And then I am going to adapt this into a dutch oven dish (I know I am the last person on earth still resisting slow cookers!). Hey thanks for learnin' me something new--I didn't know that! Now would this be a kheema masala for ground meat + sauce with tomatoes and cream? I admit it seemed wrong to use beef and call something Indian. This dish would be great in a Dutch oven if you had the attention span to remember to stir it. Come to think of it, throw the Dutch oven in the oven and it would be even easier. I'll remember that when I'm freezing in the kitchen wanting to warm up the house. Actually no masala needed, a kheema is a ground meat curry. I have quite a few on my site, as I happen to think they are India's gift to busy American moms. :) As to the beef, it is true that most kheemas in India would be made with lamb, but in fact any ground meat is considered a kheema I believe, and also there are plenty of non-Hindu communities that do eat pork and beef. For example, the Catholics in Goa who originally came from Portugal. The Parsi communities might eat beef, I am not sure. Thanks, Laura! You're a wealth of info, and The Spiced Life is a terrific blog. I'm spending hours in your archives! I couldn't get by without a slow cooker! This looks hearty and delicious. Thanks for linking up with What's Cookin' Wednesday! How many slow cookers do you have? We could start a club. Or support group. Slow Cookers Anonymous. We LOVE masala and this looks yummy and easy! I am adding it to next week's menu thanks! Good luck on being more organized--I know I could use help!